Since its inception, the ThinkPad has been a flagship for business computing best practice, where price is a secondary consideration compared to performance, resilience and reliability. 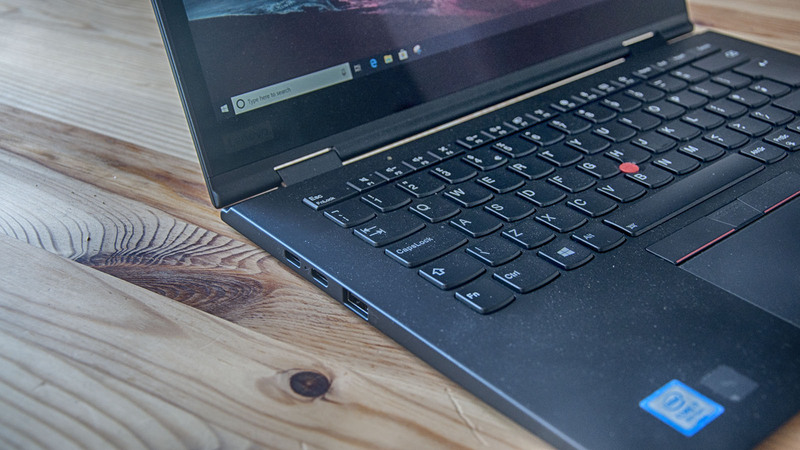 However, in a dynamic sector, embracing new markets is critical to Lenovo, and its traditional ThinkPad product lines have deviated in interesting ways. 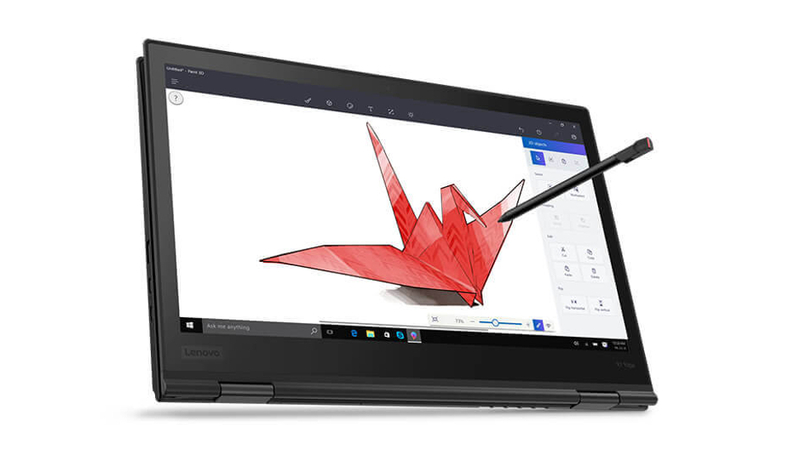 The new Lenovo ThinkPad X1 Yoga (3rd Gen) is a classic example of that divergence. It combines the latest Intel silicon and NVMe storage with a 2-in-1 design that can truly offer laptop and tablet functionality in one highly flexible package. For the serious business customer, does the X1 Yoga offer the best of both worlds, or is it a regrettable compromise? The price quoted for the review model was one from a Lenovo partner Technoworld, and not from the official online shop, which is pricier. If you are willing to gear down to a Core i5 processor, a less impressive screen and SATA storage, the machine can be had for £1,649.99 in the UK, $1,503.90 in the US, and AU$1,979 in Australia. The headline cost of more than £2,000 and $2,000 respectively for the high-end model puts this device in opposition to the Microsoft Surface Pro, HP Spectre x360 and the Dell Latitude 7285. It’s almost the same price as the Core i7 Surface Pro, but more expensive than the Dell and HP machines. Microsoft is still using Intel’s 7th-gen silicon on most of its machines, although the Surface Book 2 has one 8th-gen processor option – if you fancy paying another 20% more than this Lenovo hybrid for the same chips, memory and similar storage. The US price we’ve quoted is for the 2OLD-001HUS model, whereas our review hardware was very similar to the UK model: 2OLD-002MUK. The US machine comes with a marginally faster Intel Core i7-8650U processor, which is another 100MHz faster than the Intel Core i7-8550U in our review machine. This machine is oddly positioned within the Lenovo business laptop range. Confusingly, it isn’t in the Yoga section or even the ThinkPad Yoga division. 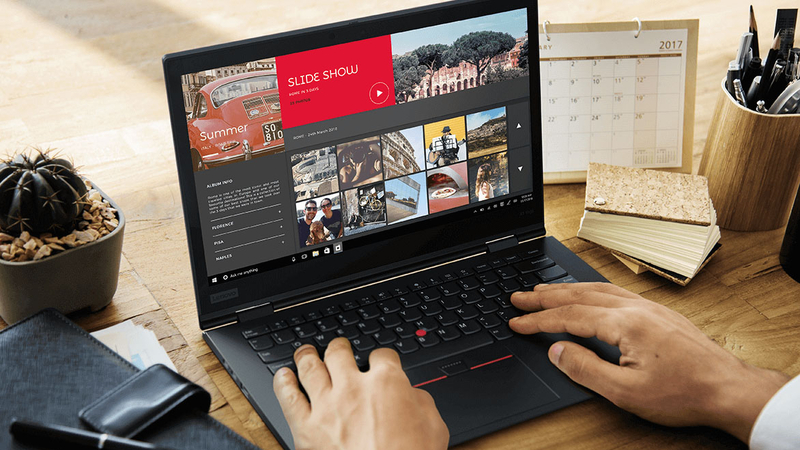 You’ll find it listed in the ThinkPad X1 collection, along with the X1 Carbon, X380 Yoga and X280. That makes it a ThinkPad X1 first, and a Yoga second, we’d surmise. All the Lenovo X Series machines are traditionally highly portable designs with extended battery life meant for those who work on the move. 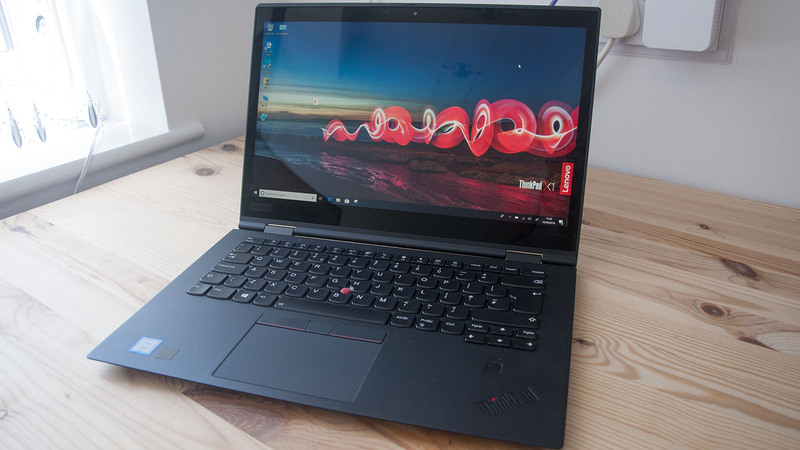 At the top end is the X1 Carbon, and one notch down from that is the ThinkPad X1 Yoga, now in its third generation which we are reviewing here. The recent revamp has brought with it Intel’s 8th-generation silicon, a WQHD (2,560 x 1,440) IPS display, up to 16GB of RAM and a quoted battery life of 15 hours. 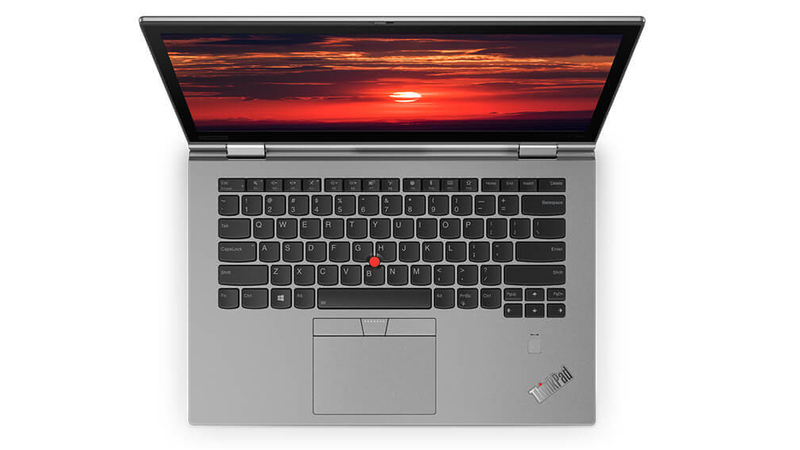 The first impression of the X1 Yoga is that it’s an elegant machine, with a slick matte black or silver finish plus the signature red dot motif. Whereas with other laptops we might talk about the amount of metal and plastic used in the device, the casing here is a carbon-fibre hybrid material that offers unique durability and strength while remaining lightweight. Being just 1.4kg, this is meant to be a highly portable system that would be perfect for any job that involves extensive travel. 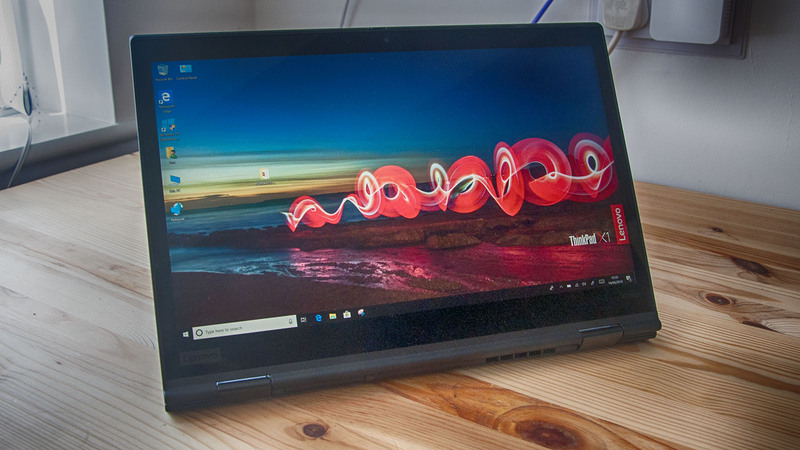 There is a quiet simplicity to this machine that belies some sophisticated engineering inside, although it’s hinted at given just how much money Lenovo is asking for it. The screen portion is a tiny bit longer than the base, making opening and shutting it relatively easy, and the textured finish helps avoid dropping the machine while doing this. Opening the lid presents you with a very clean working space, dominated by a touchpad that has both buttons on the top and bottom, and even a touch-based scroll wheel at the top. The keyboard is the ‘Wave’ design that Lenovo previously flirted with, meaning that when the machine is closed the keys retract, and they also do this when the hinge passes 190 degrees for tablet use. That makes the keys stand proud of the base surface, and gives welcome extra travel to the typing action. Another interesting feature this keyboard has, which is subtle but useful, is that the cursor keys on the right are allowed to encroach below the spacebar line, making them a little larger than normal, and therefore easier to use. 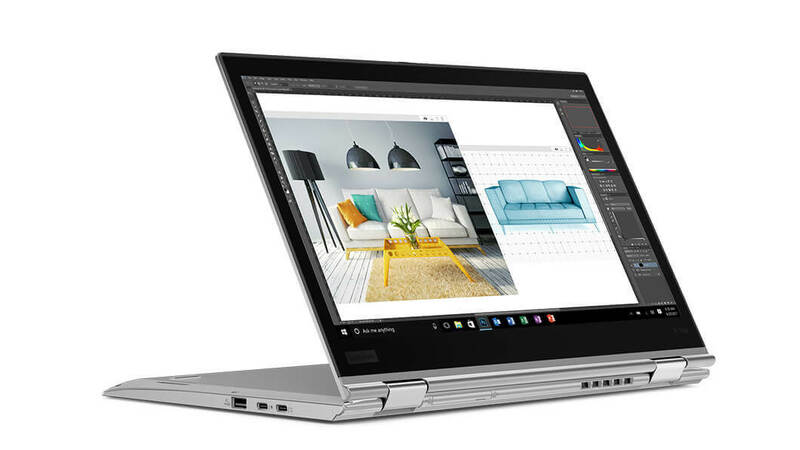 We like that move, but on the left side, Lenovo places the function key (Fn) on the outside where the left CTRL normally sits, which might confuse anyone moving from a Dell or Acer laptop. Another curious feature is the lack of a conventional LAN port. With such a thin cross-section, Lenovo designers could have used an expanding Ethernet port. Instead, they created a much smaller port and provided a short flexible adapter that you can use to access a wired network. Misplacing that cable could be a problem, but a replacement is less than the Lenovo docking station alternatives. The 2-in-1 nature of this machine forced the designers to place all the active ports on the sides, taking the space that would normally be occupied for a side cooling vent. The latter ended up on the rear, alongside a thin removable cover where you can access a phone SIM (WWAN) slot and a microSD card slot. The placement of the latter card slot isn’t ideal if you use the laptop to review photos. A better choice has been made in terms of the two Type-C Thunderbolt 3 ports on the left-hand side, which double for both peripheral connection and a Type-C charging port. Given the somewhat variable quality of Type-C devices and the power they can demand, Lenovo was smart enough to make these ports ‘anti-fry’ to avoid any potential damage issues. 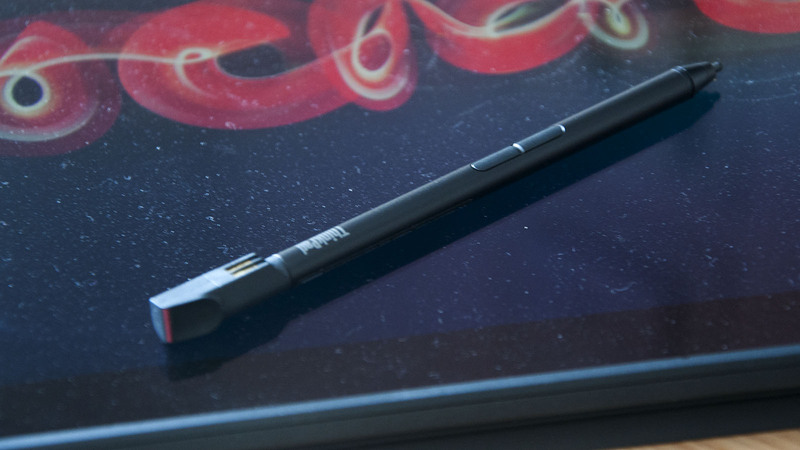 As a concession to this machine’s tablet aspirations, an active stylus is provided that was designed by Wacom. The hole where the stylus lives is designed to provide a difficult to misplace home, and also charges the device ready for use. The stylus has two buttons on it, along with the pen tip clicking function, but doesn’t appear to be pressure sensitive. One mistake made with this part is that the channel where the pen slots in is on the underside of the machine, making it easy to retrieve in laptop mode, but much more difficult to extract when the X1 becomes a tablet, ironically. A bigger issue with tablet mode here is not that the machine can’t perform this role well, but that the majority of users won’t have an obvious need for this mode of use. The failure of Microsoft to convince users and software developers to support universal apps – or whatever they’re called this month – has relegated touch and tablet modes to the bottom of most customers’ wish lists. Generally, users and businesses get Windows machines to run Win32 windowed applications, not full-screen touch-enabled versions with less inherent functionality. Having ‘tent’ mode for presentations is nice, but we’d argue that it’s hardly a deal breaker not to have this function. If you have no intention of using full-screen apps or the stylus, then you might want to consider an X1 that isn’t a Yoga model. These are marginally cheaper and are even more robust than the 2-in-1 designs. When spending this much on a laptop, you expect it to be high spec, and the X1 Yoga doesn’t disappoint. Built around Intel’s new Kaby Lake R series silicon, this is a new generation that offers four cores (and eight threads) yet has a maximum power profile of just 15W. Lenovo wanted this machine to be a flagship design, and so pulled out all the stops to make it as good as possible. One oddity with the spec is that Lenovo went with LPDDR3 system memory, which you might think is strange given that low-power DDR4 memory has been available for a while. The reason for this is that Intel chose not to support anything other than LPDDR3 and ordinary DDR4 in the Kaby Lake R series chips. And, for laptop designs, that’s a stark choice between offering the highest performance or longest battery life. The review machine had a SIM card slot at the rear for WWAN use which is optional, as is NFC functionality if you need that, too. A camera with Windows Hello functionality is also an option – although for obvious reasons that one doesn’t have the privacy shutter on it. The cheaper models in this range have a display that is the same resolution as the review machine (2,560 x 1,440), yet don’t have the brightness or color gamut of the screen in our review model. If you can afford one with this screen, we highly recommend it, especially if you do any work that involves color or presenting in natural light. A machine with this level of hardware should be fast, and unsurprisingly it is. Booting Windows and launching apps is practically instantaneous, and the only time that the machine isn’t highly responsive is when Microsoft has initiated some background upgrade exercise without asking. The weakness of this hybrid – and all the other 8th-gen platform devices – is the UHD Graphics 620 integrated GPU. This doesn’t contribute enough considering the raw computing power that is pushing it. For those doing graphical tasks like CAD or design work, or using Direct Compute, need to look elsewhere for a machine with a discrete GPU, until Intel chooses to address this weakness. Benchmarking reveals some of the best numbers we’ve seen from the Intel Kaby Lake R platform, and the NVMe storage performance here is exceptional. The drive is a Samsung PM981, an OEM-only drive that uses its Polaris V2 controller, and 64-bit Layer TLC flash memory. The performance crown has been taken over by the recently released Samsung 970 Pro, but in this configuration, the incorporated SSD allows the new Intel silicon to be well exploited. A calibration test also revealed that the exceptionally crisp 2,560 x 1,440 IPS display could represent the full 100% of sRGB and AdobeRGB color gamuts. When you combine that with a static contrast ratio of over 1,000:1 and a maximum brightness of 463 lumens, it makes for one of the best quality displays we’ve seen on a laptop recently. There is only one fly in the finely-scented ointment of the ThinkPad X1 Yoga, and that’s battery life. We’ve been upbeat about the X1 Yoga so far, but the battery life on this machine fails to live up to the high standard of the rest of the hardware. Using the PCMark08 benchmark, we explored the differences between a pure performance setup and one configured for maximum possible battery life. With performance made a priority, the X1 Yoga lasted just 4 hours 18 minutes on the Work test, and with all the power saving options ticked it stretched that to 6 hours 24 minutes. That’s a country mile from the quoted 15 hours of battery life, whichever way you look at it. Unless you never stop work and never answer the phone, the longevity you’ll get is probably a working day, but hardly any more than that. We suspect that the Core i7 processor and NVMe drive are contributory factors in this mediocre result, and it may be that a Core i5 machine might well last much longer on the same battery capacity. At least it charges quickly, having RapidCharge technology that can get the device back to 80% capacity in just 60 minutes. This hybrid is superbly designed and built, but marred by a few annoying aspects that lessen the wow factor a little. The mediocre battery life hints that you’d be better off with the Core i5 version, and accounts might well agree when they see the high cost for the Core i7 powered models. With much cheaper designs from Dell and HP that contain almost identical parts, this machine could be a tough sell at this price – even to business customers.